Here is the next motif for the 25 Motif Challenge. 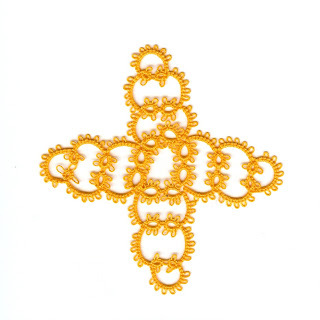 It is from the 1912 Emmanual Bocher Tatting Book. We are restoring this book during the Online Tatting Class with Georgia. I volunteered to work on pages 88 through 91. There were no pictures to work from and this is what I ended up with. It was a challenge as I like to have the pictures to look at when tatting. It helps to do the pattern, especially some of the vintage patterns. I was happy with the way this was turned out and now I am going to do it in two colors and then I will attempt to do front/back side tatting for one of the samples. When I started these pages I though I was going to have a couple of different motifs but to my surprise it was only this one. There are a lot of people participating in this project and so far it has been fun. I hope to do some more pages and find more challenging pieces to work on. Which shouldn't be difficult as there are 235 pages in this book. It was originally in French. Working has been a blast this week. I love the interaction with the people and the challenges with taking care of the issues. I do not live the 70 mile drive one way but so far and doing okay. Sadie has been a wild dog when I get home. She was not accustomed to being out all day and is hyper when I get home but still wants to be out. I called my sister, that gave me the dog, and told her I thought Sadie was ADHD. She was so bad the other night I made her go to bed. She sleeps in a dog crate and I can lock her in. It was the only way my feet were going to get some peace. She certainly was living up to her breeds nickname of Little Devil Dog! I really like this motif. I can picture several of them joined together to make a rectangular mat. Thanks for sharing! Oh very pretty! I really LOVE that color too!! !